Search Engine Optimization or SEO is the process of configuring your website so that people who are looking for you or your services can find your website on the internet using search engines like Google or Bing. At Align, we are up to date with the latest changes to the major search engine algorithms to ensure that your site is fully optimized for the best possible organic search results. From content writing, to customizing code, our SEO experts know how to make your site shine. Great SEO takes time and effort. Unlike the SEO companies who inundate you with daily phone solicitations (no, they aren’t really “your local Google representative”) , we don’t play the game of guaranteeing placement. Those sketchy strategies may work in the short term but are disastrous for your brand in the long term. We implement the long-term strategies necessary to achieve long-term success. Effective SEO campaigns don’t happen by accident. Let us plan your SEO for success from A to Z. What are the exact terms that your customers are using? Let us find out for you. What is the best way to integrate your keywords into your site? Let us guide you. 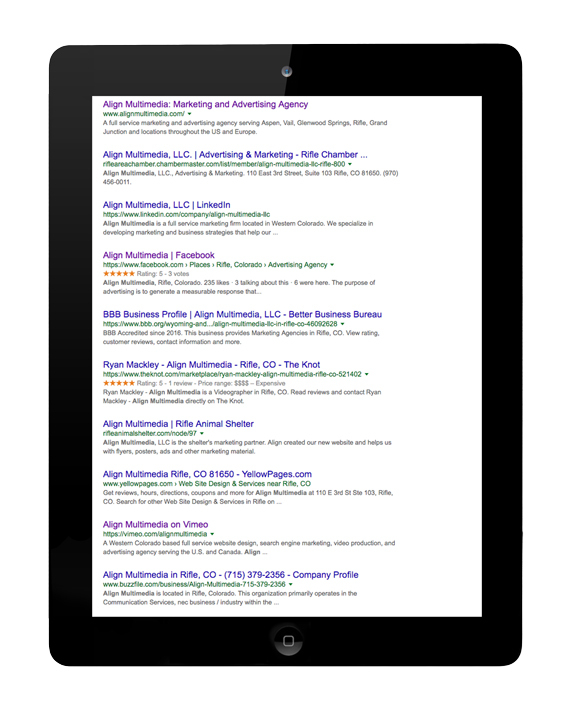 Let Align help you to figure out what is working and not working with your current website. Align will seamlessly integrate your optimization and marketing strategies. Make sure your SEO works on all devices. Let us work your keywords seamlessly into the site content.